Family, like fish, begins to stink after a week. Or so they say. So we pushed out of Vegas, pointed the Firetruck south, and headed for some Arizona warmth and sunshine. 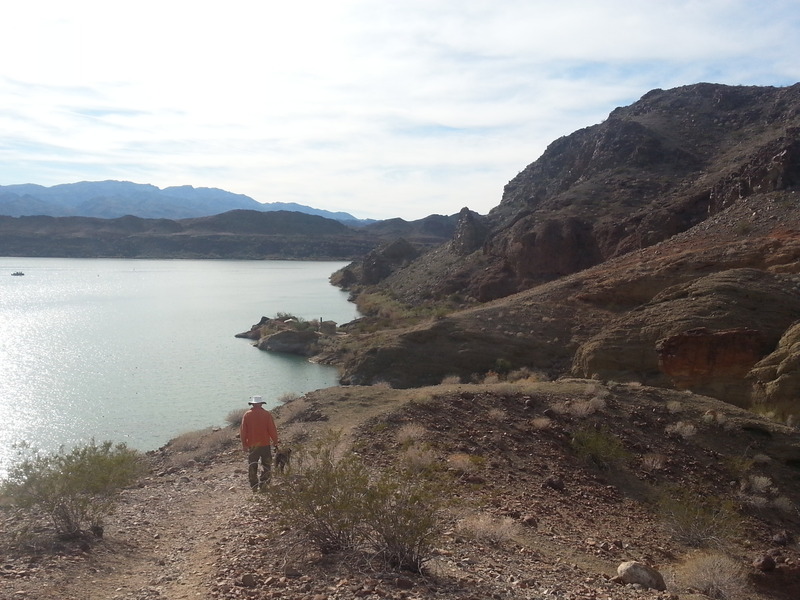 Destination: Lake Havasu State Park – an area neither of us has visited. We’re running a bit ragged. No refrigeration, although our devised solution of a plastic container of ice (refreshed daily) in the freezer section of our small refrigerator should keep things chilled. However, it does mean that we have to buy ice daily – a major PITA. Our first day in Las Vegas, I lost my contact lens (I wear just one). Do I have my prescription? Of course not! To top things off, I heard an odd pschewing noise the other day, and discovered that our campstove regulator valve was spewing propane out into the atmosphere! We’ve checked all the likely places in town to find a part, but have come up empty-handed. So, we can’t cook the food that’s spoiling in our unrefrigerator, and I’m going to get (more) wrinkles from squinting! Not a happy start. We are campers with issues. But, here we are in a great location. 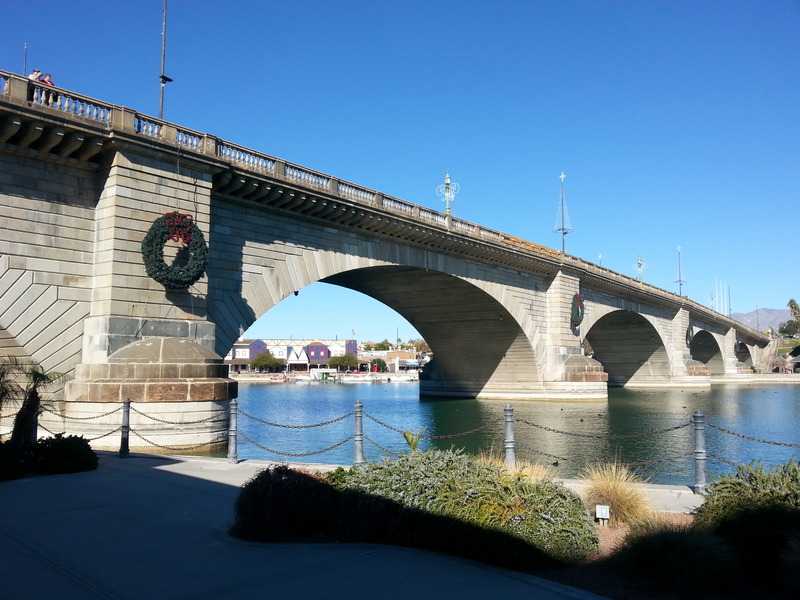 Lake Havasu City’s claim to fame is the London Bridge, which was purchased by town founder Robert McCullough, Sr in 1967, for about $2.5 million. 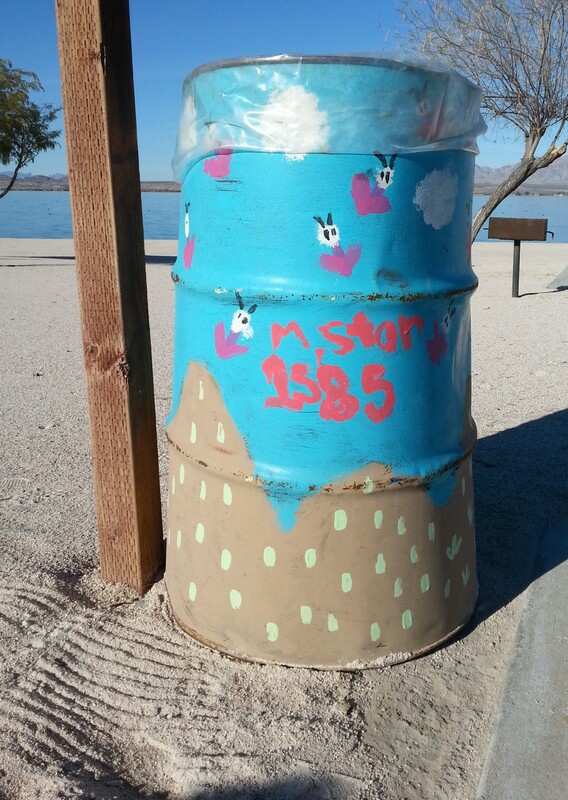 After four years of construction, it opened in 1971, connecting Lake Havasu City to an island in the Lake. Yep, we cycled across it – four times, in fact. The State Park here is a busy spot. Even though the campground is full, it’s pretty quiet. But, it’s kind of odd. The bathrooms are clean, but old. For 46 campsites, there are only two showers. The bathrooms are dim, and there’s a faint whiff of sewage in the air – worse at some spots than others. (Our space is fine.) One of the toilets must have a leak, because the floor is always wet. That kind of stuff. But, there’s a white sand beach not 40 yards from our driveway. The Nature Trail that runs for nearly two miles through the Park was cleared with a bulldozer – not so much a footpath as a throughway. My favorite spot in the Park though is the picnic area. 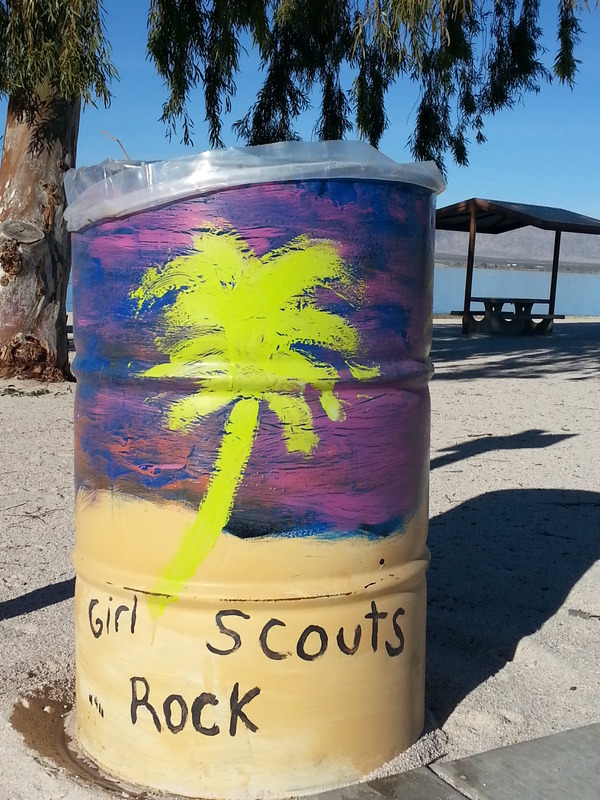 Girl Scout Troop #1585 painted all the trash barrels which dot the area, and they are charming. Jezzy reflects on the meaning of leadership An apparent alien invasion was also documented by the Scouts. All in all, a pretty nice spot to camp. 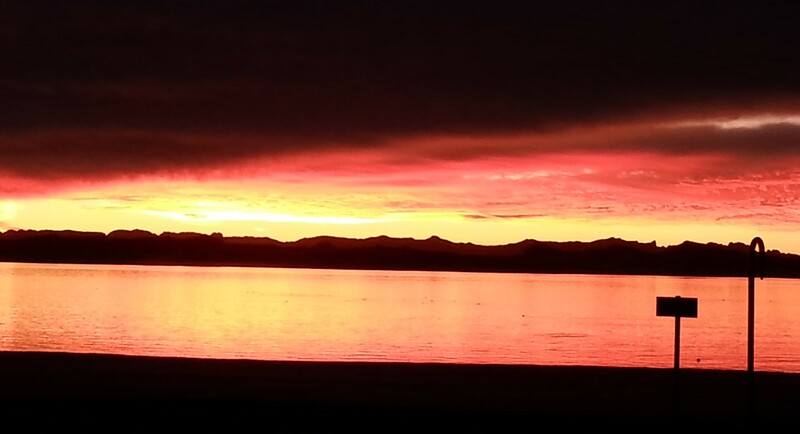 Great sunsets. Our first order of business is exploration by bike. There’s a bike trail through the city, which kept us off busy I-95. Across the Bridge, the trail continues around the island. 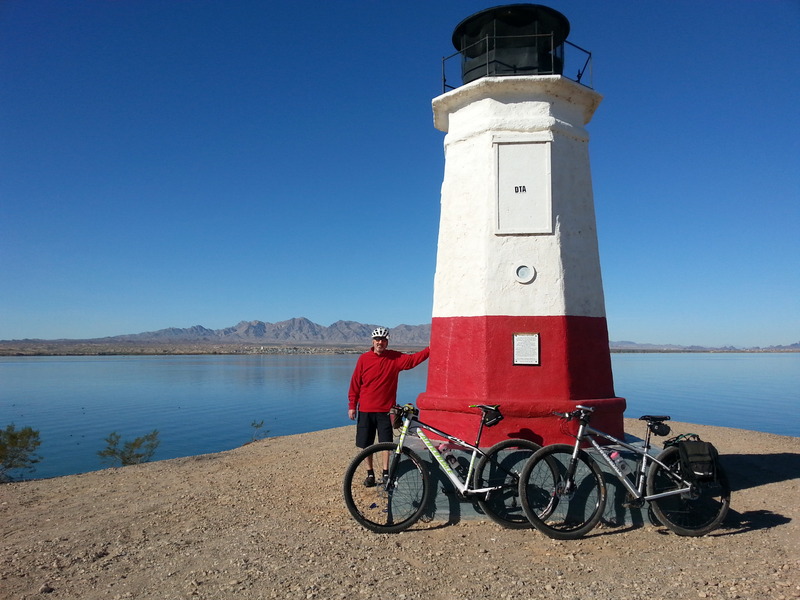 The Lake Havasu City Lighthouse Club has built replicas (many are copies of Great Lakes lighthouses), and located them in spots on the Island and around town. This area is an ORVer’s paradise. They are everywhere! It may be unfair to credit all the beer cans and bottles along the roads and paths to this group, but it seems to me that they do seem to go hand in hand. We can see dust plumes across the Lake from all the ORVs tearing across the open land there. 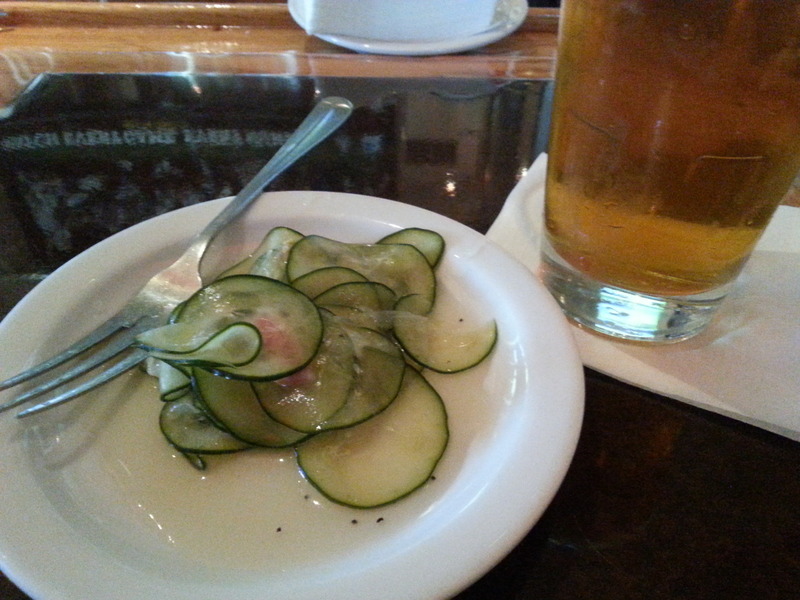 After 25 miles or so, we finish our ride at the Barley Brothers Brewery, where the bartender treated us to a sample of his homemade pickles. Spicy and crunchy – perfect as a Bloody Mary garnish. 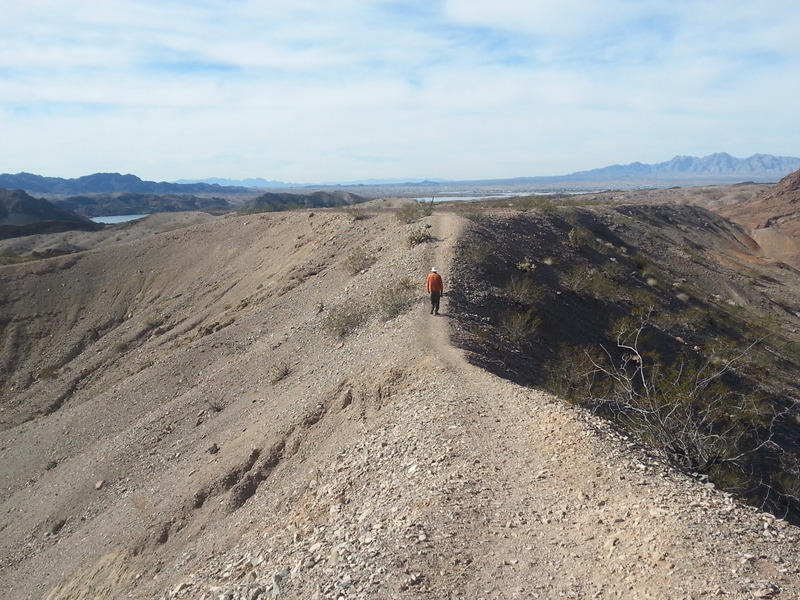 Saturday, we decided to hike at Special Activities and Recreation Area south of town. 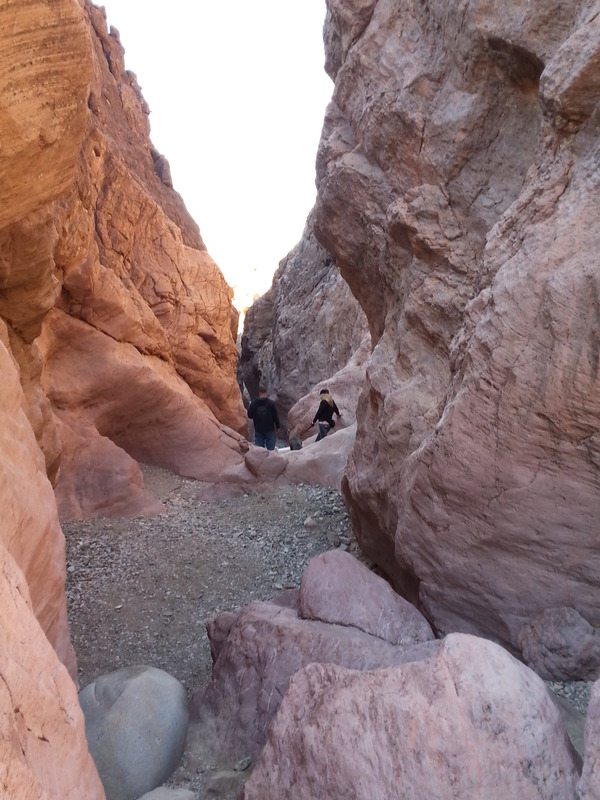 One hike goes into a crevasse or slot – known by the locals as SARA’s Crack. That’s our choice. 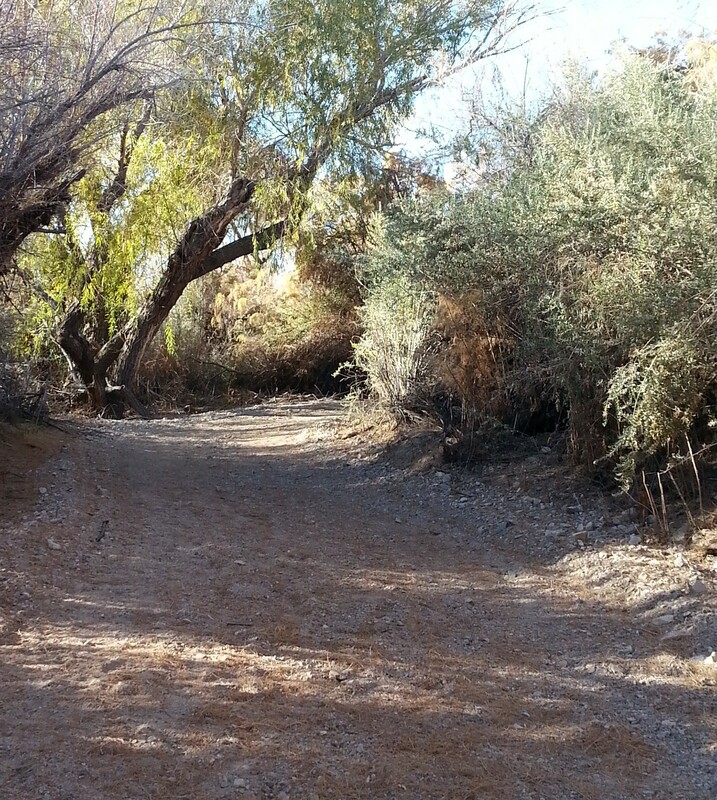 With Jezzy in tow and a backpack with water and lunch, we head down the trail. After a mile or so, we get to the Crack. Twisting along through an increasingly narrow space, we get to a spot where there’s about an 8′ drop down a slippery slope. We watch others with dogs navigate their way to the bottom – there’s a knotted rope affixed to help people rappel down/up, but that’s not much use for a 55 pound dog. John goes first, and calls to Jezzy from below. She’s a bit frantic, wanting to go to him, but unhappy about navigating the drop. Finally, she heads toward him, and has a bit of a heavy landing. Yelping that breaks my heart and spirit. But, she’s happy! We proceed along, and there are many 3′ drops – some on to small landing areas surrounded by water. It’s not going well. The straw that breaks our back is a very narrow, descending squeeze. Jezzy balks. We decided that it’s not worth it – it would kill us if she were injured because of our own stupidity. So we backtrack. Getting back up the 8′ wall was easier than the descent. I went first. John got Jezzy started, she scrambled, and I hauled her up. Done! 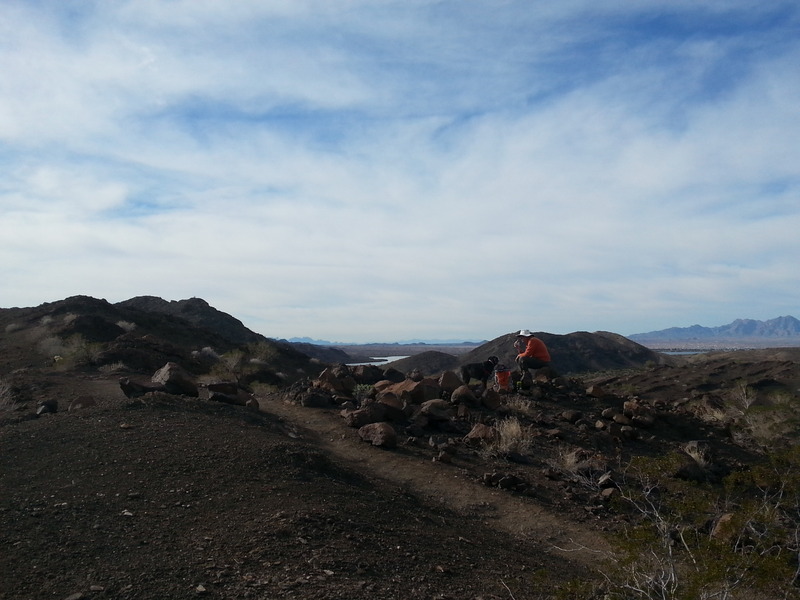 We decided to take another different trail, and wind up with a beautiful hike for the day. A quick stop at Mudshark Brewery (not nearly as good as Barley Bros), and we’ve survived another adventure. After a long day on the Trail, Jezzy can barely keep her eyes open. So, it’s Monday morning. John is scouting RV dealers, trying to locate a part for the stove. If not, we need to decide whether to buy a cheap new stove, order a part and have it sent General Delivery to us somewhere down the road, or what. I’m going to call my eye doctor and see if I can get them to email me a prescription so that I can have a lens made. Don’t know yet where we’re heading from here. Depends on how well we can patch up our sorry gear! We like simple camping, but this is ridiculous. 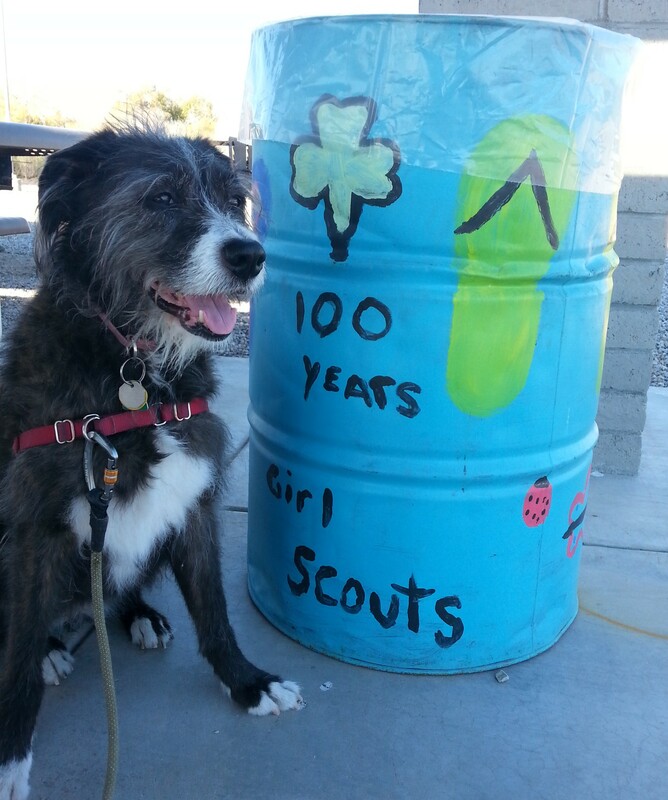 This entry was posted in Arizona, camping, cycling, hiking, retirement, state parks, T@DA and tagged Arizona, Barley Brothers, camping, Lake Havasu, London Bridgeycling, Mudshark Brewery, retirement, SARA, simple camping, T@DA by Judy Crankshaw. Bookmark the permalink. Loved the picture of Jezzie. Sorry to hear about your on-again, off-again refrigerator. Wish T@das had more reliable refrigeration. That was Strike 3 for this fridge. We are going to get a new one, but gave to wait until February when we will be in one spot long enough to get something shipped to us. Until then, we can limp along with ice in the freezer compartment + our big cooler, which we always have along. It’s always something, for sure. Love your line “campers with issues”! Seems like we always have issues! This was a hell of a trip. 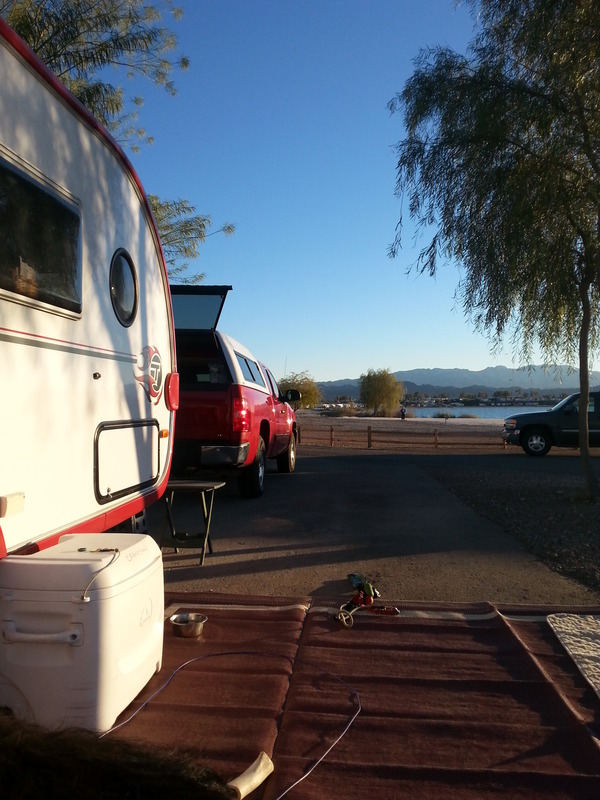 But in AZ at Picacho Peak SP for the night…..we have stayed at Buckskin Mtn SP just down the road from you…it was nice. Don’t remember a sandy beach, though. 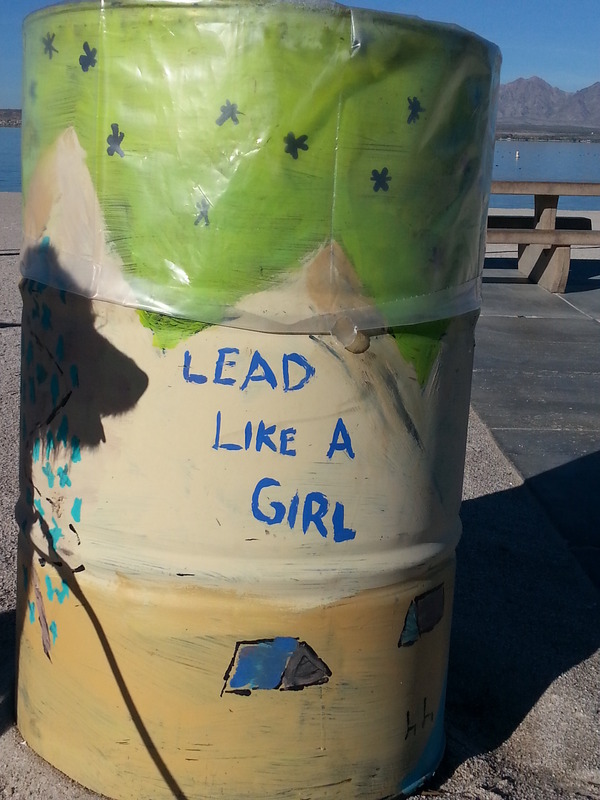 In talking with some other campers last night, it appears that the sandy beach here is a new addition from a year ago. There’s a huge pile of crystal white sand here that’s being moved around daily. If you haven’t camped here before, it might bear checking into later this year or in 2016. I wondered if you would avoid the storms. Hope you’re safely out of the path, and can breathe easily. Obviously, Jezzy isn’t a rock hound. Sorry, I couldn’t resist. Also sorry to hear about the equipment problems, but I think that I’d be willing to live on cold sandwiches to escape the -10 windchill outside my door right now if I could. Throw in the sunshine, blue skies, and sunsets, and things could be much worse. Jerry, now that we’ve got a big jar of Jif on board, we’re in better shape to deal with adversity. We got a cheapie new stove today, so we’re almost happy campers again. I should have 20/20 vision again (or whatever passes for that for me) in two weeks. Nearly back to ground zero. I’m not going to tell Jezzy what you said about her. She’s got a long memory, and I wouldn’t want her to bite you, should you meet in the future. She thinks she can do anything! And that last picture is priceless. Jezzy rules our lives. Hope we never have to camp without her. What darling pictures of Jezzy! Apparently you’re made of the stuff that allows you to forge forward. Good luck and Happy New Year! We are hunkered down here in the North East, chuckling at your wonderful storytelling about your exploits! Hi Sandi. Happy New Year. Do you have any escape plans if you’re weather gets too ugly? I hear you can plow lots of snow with an Airstream. Happy New Year. When are you coming ‘ home’ to Michigan? Well, Bob read your post early this morning and it’s now 5:23 EST. So glad that by the time I got to your blog, you had already “resolved” your issues. And doesn’t a brewery at the end of the day always make everything better? That pup of yours is a real trooper! But then so are her people! Brewpubs are the saving grace for us. We can’t make everything right, but we certainly can take the edge off! 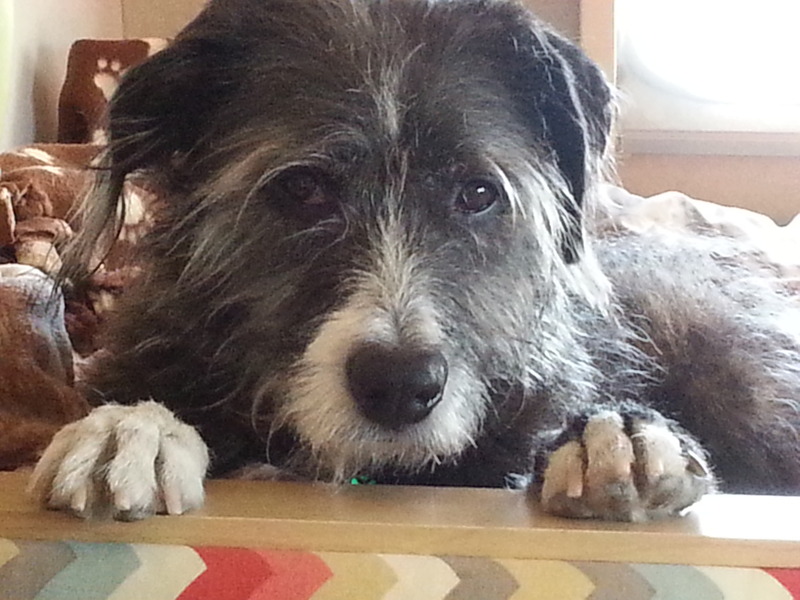 If we had been brave enough to take the leash off Jezzy, and let her name her own way, perhaps she would have been okay. But, we just weren’t willing to take a chance. She just turned 9, and that’s a rough age to learn new physical skills. We were very happy with Plan B. Such a list of adventures and mis-adventures. Hope you get your eye back soon. With all that beauty, it must be frustrating to be blurry. Is that the original London Bridge from England? I vaguely remember something about that from many years ago. It’s a beautiful bridge. Love the architectural details and classic design. Those slot canyons are amazing. You’re braver – or just more agile – than I am. Hope you get your cooking and refrigeration issues settled. Eating is one of my favorite activities. I’m really spoiled that way. Happy travels. It is the original Bridge – what a crazy idea to move it to AZ, eh? Life wouldn’t be so blurry if I would wear my glasses, but you know how I am…..
Got a new stove, new contact in a week or two. In the meantime, we’ve got ice…..we remind ourselves that its camping – don’t want to get too sissified! You sure can undo a lot of bad juju with a bit of sunshine. Where are you and Yoly now? Happy New Year! 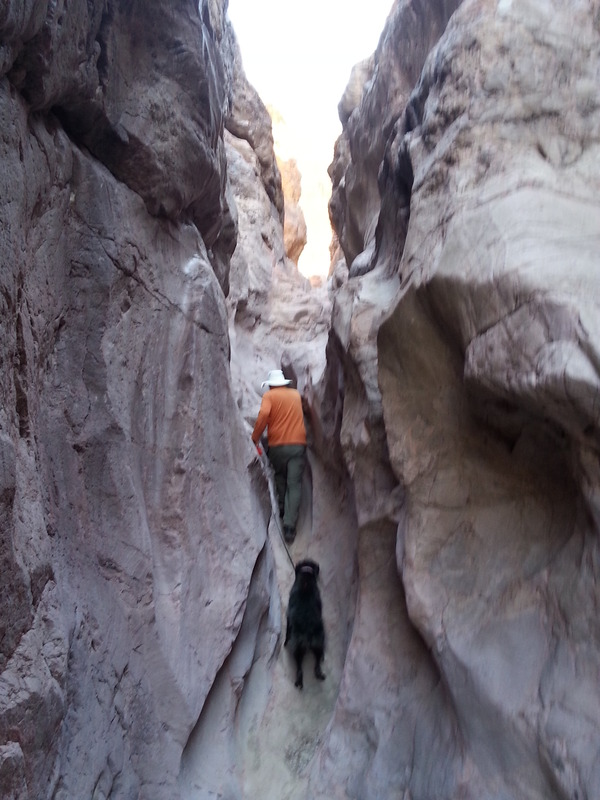 I think John and I could fairly easily have navigated the rest of the way thru the slot canyon, but Jezzy was very uneasy, which in turn set me off. Very hard to see her in panic mode. Not worth the risk. Can’t decide whether it’s better to have everything go to hell all at once, or space it out over the trip. Hope we are biting the bullet, and can put it behind us. I always chuckle when folks tell us “we’re living the dream” because those break down and repair days can be tantamount to nightmares and not dreams. Jezzy sure is a trouper to go on that hike. Glad you all made it back safely. Hope you get the trailer all fixed up sooner rather than later and can continue the journey in comfort AND perfect vision. Did I already recommend Gilbert Ray CG and the Sonoran Desert Museum in Tucson? We’re on the comeback trail already, Ingrid. Ordered a new contact that I can intercept in a couple of weeks, and John bought a new stove this morning. Fridge will have to wait until we are in a spot where we can get a new one shipped. That is the least if it. Guess it’s a wonder more stuff doesn’t break, given the way we rattle down the road. Jezzy, like me, has a very short memory, so she’ll be ready to hike again at the next opportunity. HaveNOT refrigeration, HaveNOT stove, HaveNOT contact lens……in all other respects, we’re OK! Happy New Year to you and Renae.